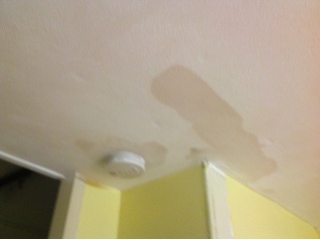 Woke up this morning to a wet spot on kitchen ceiling, suspiciously under the upstairs bathroom. Urgent calls to neighbors for name of a plumber finally netted one who will be here tomorrow morning. No showers tonight. Spent the rest of the day talking to a slater, a mason,a painter, and a builder. I am thankful for the experience we had at the log cabin and with our rent houses. Otherwise I could be easily buffaloed by the facia/soffit/drip cap/repointing/flashing discussions I had all day. Estimates for repairs coming later in the week. Heart attack to follow. Rewiring upstairs and rebuilding front porch both launch next week. What will I do when I don't have building projects to occupy myself?